The woodpeckers are crazy today, flying into the windows, boring holes into the house, and twirling together as though spring, and not a cold and foggy Carmel summer, is in the air. 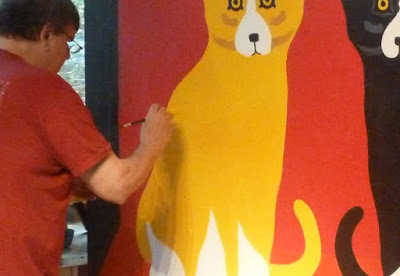 As I watch twenty or so, doing everything at once, barely pausing for rest in the oak tree outside our window or for a sip of water atop the granite fountain, I think of George Rodrigue, sleeping finally after a marathon of creative multi-tasking. “My brain is exhausted,” he sighed last night. Over the past few weeks he immersed himself in projects, all thought up on his own and pursued with fervor, his delegation limited to ‘edit this’ or ‘print that,’ before he’s on to the next item on his mental checklist. 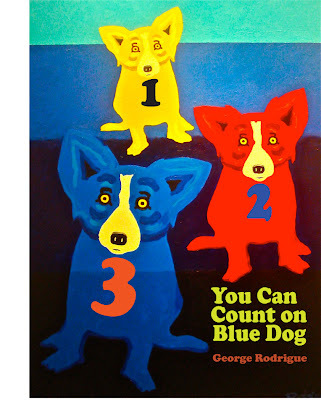 He wrote and designed a children’s book application for Apple’s iPad, a clever combination of paintings with added elements such as butterflies or flowers or doughnuts, designed to teach colors, shapes, and numbers using Blue Dog paintings and an artsy, Louisiana-inspired text. 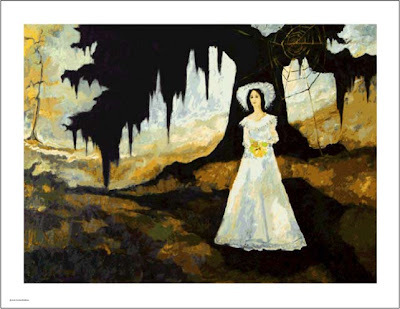 He reworked one of his early Cajun paintings within his computer, increasing its contrasts of light and dark, and breaking down its colors for a silkscreen,* the first print he’s ever made of Cajun Bride of Oak Alley, to be released next month. 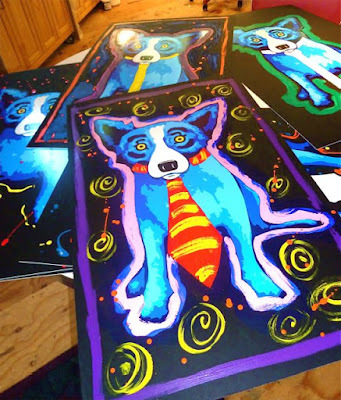 He shipped his newest paintings to New Orleans and arranged through video, photographs, and over the phone for their installation prior to Dirty Linen Night so that, even though he couldn't be at the artsy French Quarter party himself, he was there in spirit. He spent more than a week composing a poem, a many-stanzaed description of his new exhibition, premiering October 30th in the new New Orleans gallery. 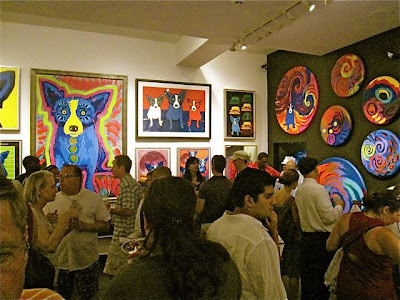 He also designed the catalogue, chose related paintings, created a new Blue Dog silkscreen, and began a series of mixed medias on black, all connected to this show. He fielded offers on more than a dozen outside projects, ultimately rejecting them all. “There’s no doubt to me that nobody has made the leap yet with technology in the arts,” commented George. He also hooked me up with an iPod, so that we finally, reluctantly, abandoned the CD’s for good; he tuned in for pre-season football, debated politics with his friends, and kept me company in the garden, where we have our best crop of cutting flowers and herbs in years. And sketched out a new one, preparing for one last day at his easel before we go home. 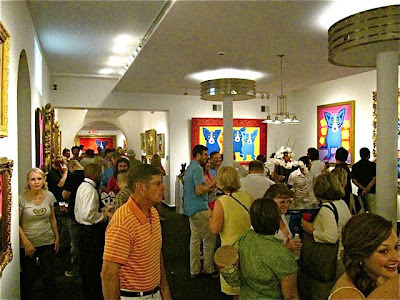 *To learn more about Rodrigue's print-making process, specifically his recent fine art silkscreens of early Cajun paintings, see the bottom one-third or so of the post "The Aioli Dinner." 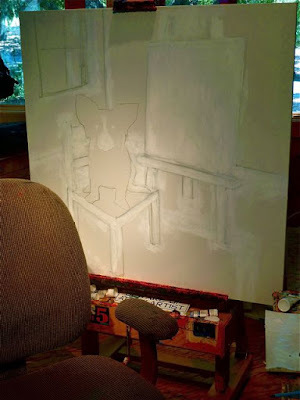 For more on George's Carmel studio, see the post "Not Painting in Carmel"
No wonder I haven't talked to you! You've been busy! An Ipod-- It's about time! Great post. Hi Donna- check out the post BLUE CAT under "lagniappe" to the right of this post. It tells the whole story. WOW...I am exhausted just following the energy flow.....................................Meow.